When Annie and I got married in Pomorie, after the wedding we made our way to lay flowers at the statue of this most romantic of poets. Yavarov was a Bulgarian stereotype – a freedom fighter, sufferer of two doomed love affairs – one woman dying of consumption, the other shooting herself, victim of persecution at the hands of his compatriots, like so many other Bulgarian poets, he committed suicide. His poems are intricate and so difficult to translate, but here are three simpler ones to give you a flavour. You were gorged and weary. For the end of you – the wretched part I played. Torn between love and hate. Of tears – my doubly wounded heart? And the two of us burning – don’t come too close. Torn from myself, I’d come to know you. Myself so close, so very close to you. This is Philip Larkin’s skeptical response to the notion of rational progress leading to the perfection of human life. For Romantics, what does not change is human susceptibility to crimes of passion – most notably the recent killings in Arizona. Rationalists cannot account for these crimes and therefore try to sweep them under the carpet. In the Former Yugoslavian Republic of Macedonia a special needs teacher asserts his Bulgarian ethnicity. He is called a traitor to his people and is sacked from his job. A mother involved in a bitter custody battle finds herself in a Macedonian gaol. Is it coincidence that she has publicly asserted her Bulgarian ethnicity? Finally, the Zdraveski family arrive as political refugees in Blagoevgrad. Mr Zdraveski is a former para-military policeman, who fought Albanian Separatists in the early years of the new century. More recently he was imprisoned and tortured by his fellow Slavs – because he asserted his Bulgarian heritage. Slav turns against Slav – even without all the tortuous claims and counterclaims on the true ethnic origin of “Macedonians”. My former student Asen Yordanov has set up a support group for this family which now numbers over a thousand members. We can be sure that dramatically opposing views on these events will be found in Macedonia and Bulgaria – causing great quakes below the seemingly placid surface of everyday public politics. As mainstream newspapers and politicians in both countries ignore these stories and bask in the approval of EU functionaries and American ambassadors, there is a geyser of fury building up in the internet. Faced by the nationalist broo-ha-ha in both Bulgaria and Macedonia, the rationalist feels helpless. How in this European, social-democratic, multicultural, materialistically cosy world can people get their knickers so passionately twisted? Humanist medicine fails in this case as it does in the USA, Pakistan and Belgium. People trust their powerful emotions.  Material comfort is a distraction from the inevitable ennobling struggle between clear right and wrong.  Poor people are happier than the rich because they have hope and faith.  We are individuals but we must remain loyal to the traditions of our family, our tribe, our religious beliefs and show no tolerance to those who threaten these.  We should be rightly suspicious of foreigners who seek to influence the way we behave. They have no understanding of our soul. They are contemptuous of all traditions that stand in the way of their materialist projects.  Our version of History is the key to understanding present difficulties. We should never lose the opportunity to explain the present in terms of a glorious past of moral certainty.  Dostoevsky was right about the moral superiority of the primitive over the sophisticated. An Englishman, born into the warm hands of the newly founded NHS, told by my Prime Minister that “I’d never had it so good”, taught in schools where the map of the world was coloured red, it was difficult for me to resist a rationalist view of the world – particularly as a crowded pub in my then home town was blown up by the IRA. But then there is Philip Larkin’s sly debunking of the “Progress” myth. What’s the good of material comfort if it leads to oblivion sitting lonely in a chair in an old people’s home, I am feel vulnerable to Bulgarian suggestions that my culture is poisonously deficient. As a citizen of the world, I fell in love with a community living through difficult times. I shared songs, passions and anger, unfelt in my anaemic homeland. And as that daddy of English Romanticism, William Blake posited: “Without opposites, there is no progression.” Rationalism has to be opposed by Romanticism. And while a shrinking generation of honest hard working Bulgarians hold on to the hope that with help from the rational great powers and new muscular politicians, economic well being will conquer all the problems, the nationalist romantics let loose strident sirens of alarm about:.  Wilful amnesia by the elite of past wrongs – particularly atrocities and ethnic cleansing committed by the Ottoman Empire, and the historic attempt by the Greek Patriarchate to destroy the independent Bulgarian Orthodox church. Be sure that there are similar romantic movements in every Balkan country – and as I discovered when once caught sitting on a sofa between a Serb and a Croat, the truths that these movements enunciate are radically different, but passionately justified. The strength the romantics draw on is their version of the past – and they will talk about the present as though nothing has changed. Truth is impermeable. Thus, one commentator will characterise the present day as a new “Time Apart” – referring to Anton Donchev’s novel about the enforced Islamification of the Rhodopes centuries ago. This commentator would have us believe that Bulgaria’s neighbour, NATO partner and candidate for EU entry still poses a threat of Genocide. Like the American Tea Party with their evocation of a frontier gun-law past, Bulgarian romantics quote Haiduks and gun toting revolutionary leaders. We should not underestimate the power of Romantics. After all in the nineteenth Century they brought rational Empires crashing down and shot the starting pistol for the First World War. But the soul of the whole nation. He’s human – why – what’s to be done? His very soul is up for sale. ‘Cos the deals are just too good to miss. To the orphan, he’ll be kind. You feed him, brothers, with your grind. He’ll guzzle all the goodies without fail. Heavy, my soul! Pour out the wine! Shame or glory – what’s it for? A fighting spirit, true belief. And rob us in most noble fashion. Priests rip them off with liturgy. Rob them, you unfeeling bastards! Rob them, so they scarcely stand. Bite all oppressors in the arses! Let’s break through these strangling walls! And you…you are just idiots! News comes into the Standart press room that four Bulgarians have been arrested in France for stealing tons of honey from a warehouse. There’s a short debate. Is this front page stuff? There’s the baby in the freezer story rumbling on, Ex State Security Reds still running the embassies, the constitutional crisis between President and Prime Minister, the persecution of Bulgarians in Macedonia. All in all it is a pretty slow news day. Hang on it says the Honey thieves were gypsies? That’ll teach those French for being so smugly pro-human rights. But Boss, the French are trying to deport our gypsies! That clinches it. Get me a good picture and we’ll run it as a top story. So some student journalist clicks on internet images. Here we go Boss! I’ve got a smudged picture of a warehouse. No-one would guess it’s Nigerian. Or what about this – bees buzzing round the heather? I’ve actually found a picture of a French courthouse but it looks very boring. Your dirty mother! Where did we get you from? 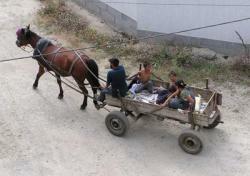 Just find me a picture of gypsies looking well typically gypsy! Yeah, well this will do the trick – it’s an aerial shot of a dilapidated cart on a dusty mountain track. There’s a half naked man and he’s definitely brown and the woman’s all huddled up with a scarf. They could be on their way to steal something! Great.That’s the kind of picture we want! Run the story!